Months ago, Leigh had never been exposed to intelligent self-balancing electric unicycle of any brand. Two month ago, she bought a set of FOSJOAS two-wheeled intelligent scooter K3, which was latest model released by Moben Global Inc. From the day she had it on, her life changed a lot. Each day, she rode it to work and steered it to home after getting off work. Even at weekends, she rode FOSJOAS K3 for the outdoors. As riding FOSJOAS K3, she viewed the beautiful scenery around her. The stand-on scooter had never let him feel tired at not. She took to this model by Moben Global Inc.
Today, she is going to take part in a party which her best friend Ken will attend too. In the party, the two friends come together and salute to each other. During the interpersonal conversation, Ken makes the endless complaint about his frequent lateness of work because of the crowded traffic. He has to spend much time on waiting on a bend for the traffic to go smooth. At these words, Leigh strongly recommends FOSJOAS K3 to him. She tells him of the same experience of being late for work without FOSJOAS two-wheeled self-balancing scooter K3. Now, she bought a set of FOSJOAS K3. She rides it to work and she is never late for work from then on. At the same time, it saves her much time in the rush hour. There is no need for her to wait at junction. Ken is tempted by her scintillating description and gets considering to buy a set of FOSJOAS K3. 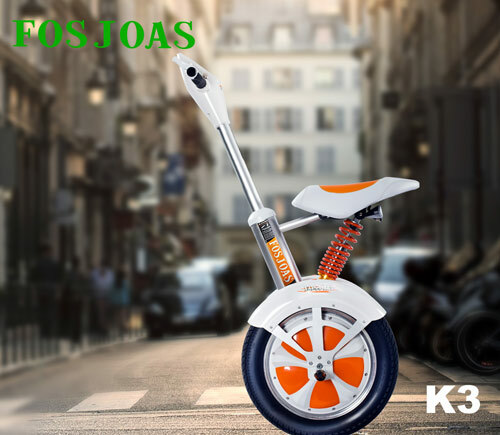 Actually, Ken has heard of FOSJOAS electric self-balancing unicycle K3 that is created by a worldwide famous scooter-maker-Moben Global Inc. This time, he heard the personal experience of riding FOSJOAS K3. Thus he believes in the performance and virtues. Leigh adds that he could buy other models of FOSJOAS. There are many other two-wheeled scooters like V9 and U3. These are also superb.